This drug can cause serious harm (possibly fatal) to an unborn baby if used during pregnancy. Therefore, it is important to prevent pregnancy while taking this medication. Consult your doctor for more details and to discuss the use of reliable forms of birth control while taking this medication. If you are planning pregnancy, become pregnant or think you may be pregnant, contact your doctor right away. Who should not take Lotensin? Benazepril is used to treat high blood pressure (hypertension). Lowering high blood pressure helps prevent strokes, heart attacks, and kidney problems. Benazepril is an ACE inhibitor and works by relaxing blood vessels so that blood can flow more easily. It may take 1 to 2 weeks before you get the full benefit of this medication. Tell your doctor if your condition does not improve or if it worsens (such as your blood pressure readings remain high or increase). What conditions does Lotensin treat? Dizziness, lightheadedness, drowsiness, or headache may occur as your body adjusts to the medication. Dry cough may also occur. If any of these effects persist or worsen, tell your doctor or pharmacist promptly. Although benazepril may be used to prevent kidney problems or treat people who have kidney problems, it may also rarely cause serious kidney problems or make them worse. Your doctor will check your kidney function while you are taking benazepril. Tell your doctor right away if you have any signs of kidney problems such as a change in the amount of urine. This drug may rarely cause serious (possibly fatal) liver problems. Tell your doctor right away if you notice any of the following rare but serious side effects: yellowing eyes/skin, dark urine, extreme tiredness, severe stomach/abdominal pain, persistent nausea/vomiting. List Lotensin side effects by likelihood and severity. Before taking benazepril, tell your doctor or pharmacist if you are allergic to it; or to other ACE inhibitors (such as lisinopril); or if you have any other allergies. This product may contain inactive ingredients, which can cause allergic reactions or other problems. Talk to your pharmacist for more details. What should I know regarding pregnancy, nursing and administering Lotensin to children or the elderly? Does Lotensin interact with other medications? 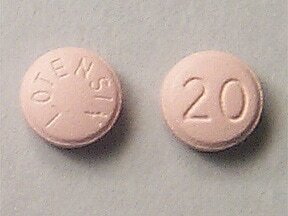 This medicine is a beige pink, round, coated, tablet imprinted with "LOTENSIN" and "20". 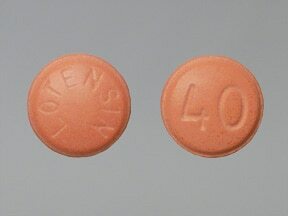 This medicine is a dark rose, round, coated, tablet imprinted with "LOTENSIN" and "40". Are you considering switching to Lotensin? How long have you been taking Lotensin?